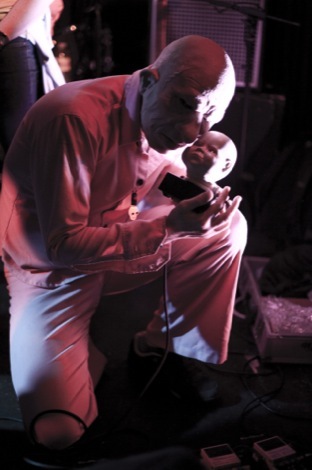 Gimp masks, poly-rhythmic gumbo and pig-men, Getintothis’ Stuart Ross digests Evil Blizzard and a pocketful of peyote. Friday night at the Mello Mello and it’s haaaaawwwwt. We’ve got beer, got our music reviewing shirt on, got some sweaty knees. Cold beer, sweaty knees: can’t fail. Anti-pop were our hosts for the evening and we’ll let you know up front – it was an evening of ups and downs which ended on a definitive high. First up were the fetish mask-wearing, laptop and guitar-bothering Minion delivering their take on heavy rock. We’ve nothing against laptop usage, playing to backing tracks and so forth, so that doesn’t have any bearing on the matter. But we just didn’t get it. 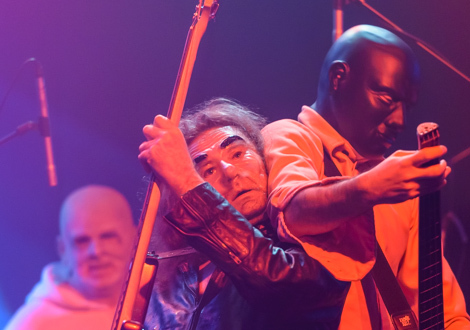 The guitar playing was pretty good, the laptop programming was alright and we couldn’t really work out what the guy was singing about because he was wearing a leather gimp mask but we’re fairly certain you have to really work on you enunciation when you’re wearing one of those things. A modest start to the night. Third Thumb followed – one of them plays drums and the other guy plays a whole heap of stuff and very impressive it was too; lots of loops held together by some corking kit work, capturing lots of different styles in a poly-rhythmic gumbo. It sent you ack to the days of Big Beat and we were almost tempted to dance – which is saying something for us. The overall effect was of two men trying to work out hard sums in public and doing it with flair and funk. It made us happy and on the strength of that w’d catch them again. On next were Elmo and the Styx and we had some trouble with them. We dig punk rock as much as the next person, but you need some wit and charisma to do it right and in mour book that was severely lacking. Given the looks on the faces of a number of people when one of their songs was dedicated to “all the moderately attractive girls out there” we don’t think casual misogyny goes down to well. A low point. The evening’s high point was definitely headliners Evil Blizzard. 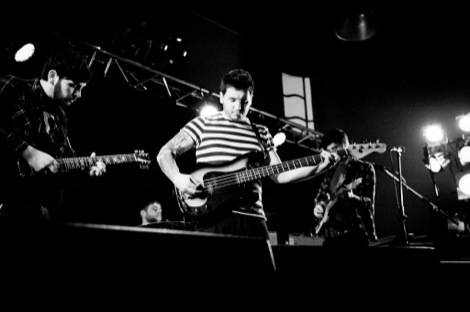 Four bass players and drums. Everyone’s wearing masks and there is an amazing groove going on. In our notes, and they were barely decipherable by this point we wrote: “every city needs a masked bass collective” and underlined it three times. The music ranges from heavy rock to some wonderfully low slow dub. 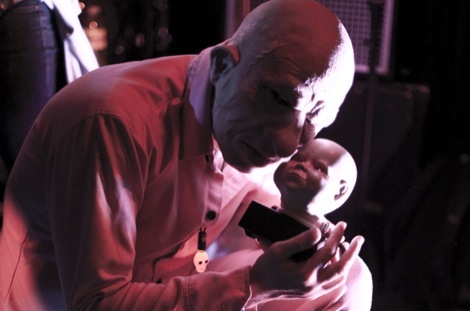 They even have a Theremin made out of baby doll’s head. We might have dreamt that though, we’re not sure. We’ve also scrawled “Quaaludes and Peyote” so, who knows? At some stage a man in white overalls wearing a pig mask wonders through the audience and by the end the stage is full of people dancing. If you get the chance to catch them, you should definitely get along. Getintothis‘ final entry, and it would appear we were holding the pen in our teeth, is “Evil Blizzard Wins”. Sums it up nicely we think. 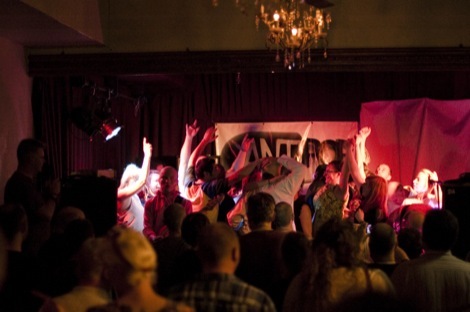 Getintothis reviews The Fall, Evil Blizzard, The Temps: East Village Arts Club, Liverpool. 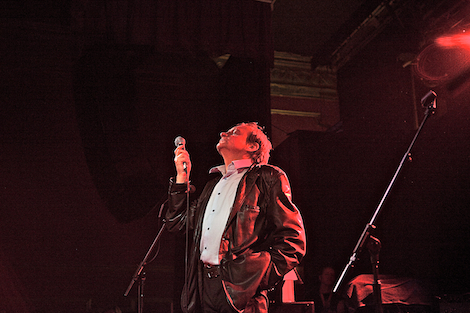 Getintothis picture gallery of The Fall, Evil Blizzard, The Temps: East Village Arts Club – picture gallery. Getintothis reviews Antipop presents Southport, Acid Drop, Rasta4eyes, Droves: Mello Mello, Liverpool.